Cod Opening 2014 - a memorable start to the season! G'Day Raiders, It's been many months since I picked up a rod but I have been very active in the sport in other ways; primarily by attending public forums and corresponding to regulating bodies regarding the slot size limits for Murray Cod in Vic. 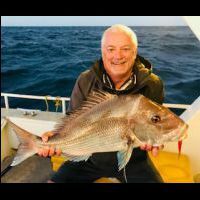 Initially, the proposal was as follows: Vic slot limit 50cm to 70cm - 1 fish from the rivers and 2 from the impoundments NSW slot limit 60cm to 80cm - 2 fish in possession I (and many other interested fishos across Vic/NSW) were advocating for 55cm to 75cm slot limit for both States, with the possession limits as proposed for Vic. Several weeks ago I was delighted to receive notification from Fisheries that the new slot limit would in fact be 55cm to 75cm across both States! The possession limits would remain as per each state as discussed previously. A better outcome for all concerned in my opinion. As older members would know, I usually spend the first full weekend of the Cod Season fishing Lake Mulwala. This year it was decided my younger brother and I would fish local waters on the first day of the season. We decided on the Loddon River approximately 30 minutes from my home. We met at the boat ramp at 6am and were very pleased to see the water teeming with activity (predominately redfin feeding on shrimp on the surface) and very few boats in our preferred target area. Conditions were overcast, water clarity was the best we'd seen in years and the water temp was 24 degrees. We pushed off the ramp, engaged the electric and headed off for the first day of the season. Ten minutes later and I have my first inquiry. A couple more casts into the same spot did not encourage any further action so we moved on. A short time later and my brother mutters “Yep” and I turn to see him fighting a spirited little cod that made it's way quickly to the net. Approximately 15 mins into our season and a 45cm cod is caught and released... things were looking promising! A short time later I sent a long cast into a shallow area full of boulders. The spinnerbait survived half a dozen turns of the reel before it was inhaled by what initially appeared to be reasonable fish. I applied more pressure to the fish and it obligingly swum out of the shallow water and made it's way the the deeper water in the middle of the river. This seemed to be its cue to 'hit the afterburners' and it proceeded to drag us along the calm water for almost 40 meters. Deep, slow tail beats confirmed what we now expected – this was a much better fish than was first thought. Fortunately luck was on our side and the battle slowed in one of the lesser-timbered areas of the river and with a little more patience and perseverence we finally got to slide the net under a new PB. 94cm of very memorable Murray Cod. After a few happy snaps and a whispered 'thank you' to the piscatorial Gods she was slid back into the water and sent on her way no worse for wear. We spent the next 45 minutes reliving the capture and throwing spinnerbaits and crankbaits at our favourite stretch of bank without success so we pushed off to another reed-lined bank that we have had success with previously – especially with yellas. 10 minutes later and my spinnerbait is hammered again. The weight and struggle felt through the rod suggested it was a pretty good fish but it was far more erratic than the 2 previous fish so I was confident I had hooked a yella. Imagine my surprise with this horse surfaced a short time later 55cm of wild river yellowbelly in prime condition and yet another PB river-caught fish for me. More celebrations and photos which were cut short by a short sharp thunderstorm accompanied by rain and lightning. We were seriously giving consideration to heading back but the storm was over almost as quick as it began and the conditions cleared again. Over the course of the next 90mins we caught and released another 2 Murray cod and kept 2 table-sized yellas that fell to crankbaits. Unfortunately my brother drove the hooks into a very good fish which proceeded to wrap him around some underwater structure and we forfeited fish and lure. Our memorable trip was almost over when once again my brother muttered “Yep … hehehe; check this out”. He had hooked a small cod approximately 35cm long, and it was being hammered by a slightly larger fish that was trying to pinch the lure out of its mouth! When the small cod was landed we noticed the claws of a sizeable shrimp protruding from the fish's gullet – he was obviously one very hungry little fish! On that note we decided to call it a day and headed back to our respective towns. I showed my young son the photos from the day's session and I have one very excited little boy on my hands now! It appears we will be returning to the same spot this weekend to see if we cant find similar action for him to enjoy. Apparently 'Pa' is coming along as well … I'll keep you posted! For those who are interested, the combo I utilised was a 3-7kg Daiwa SOL baitcaster rod matched to a Shimano Chronarch 200E5 reel spooled with 25lb Powerpro braid and 30lb flurocarbon leader. The lure was a 3/8oz Bassman Spinnerbait in blue and white. First Cod for my boys. This is one event that all Raiders should try to attend. I had a great time at the last event and I would definitely attend if I was still in NSW. There is a huge knowledge pool amongst the forum members and thankfully an exceptionally high percentage of them are more than happy to pass on their advice and guidance to like-minded fishos. It's also a top day for networking and finally putting a 'face to the name' for some of the members you have been following on the site. Pack up the family, throw some gear in the car and head off to this terrific day. I hope everyone has a fantastic day. I look forward to the wash-up report when the fun is over! Cheers Hodgey.